The dead are back to haunt the living. Evil spirits crowd the streets after dark. Are you in danger of being ghost-touched? With ghostly criminal cases on the rise, psychic investigations agents are in demand as never before. 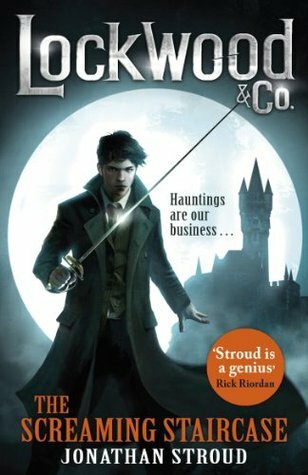 The smallest, most ramshackle – but arguably the best – of these agencies is Lockwood & Co.
Meet the dashing, scatty Anthony Lockwood; his loyal, book-loving deputy George Cubbings; and their newest agent, brave Lucy Carlyle. The book took a very long time to get started. About 1/3 in, the main story finally began; I was already considering putting down the book, because I don’t like extremely long introductions. I’d much rather get thrown in without knowing what’s happening. The world the story takes place in, is the same as ours, except… about 50 years ago people starting coming back as ghosts after they had died, to haunt the living. The set-up and the world created by Stroud is great. I could imagine a great many stories taking place here. The story itself is not particularly grasping or special. Once I had finished it, I couldn’t even be bothered to read the first chapter of the next installment in this series (which was printed at the end of this story). It just didn’t draw me in. It was an ok read, but nothing special. Oh dear! I’ve just uploaded the audio version of this one onto my granddaughter’s Kindle, so I hope she enjoys it more than you did. That said, she’s severely dyslexic so doesn’t read, therefore she may not find it as predictable as you did:). Have you read the Bartimaeus trilogy?